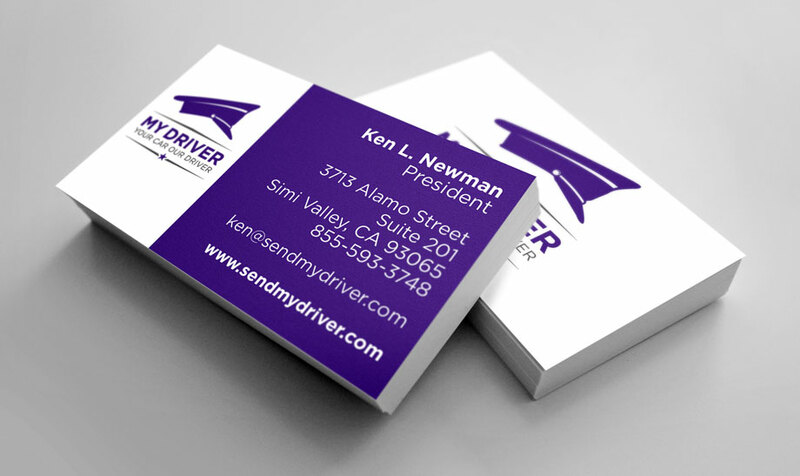 My Driver is a chauffeur service in the Los Angeles area, but uses your own car. So–want to go out bar hopping with friends but don’t want to sit in a smelly taxi? Need a ride to and from a medical procedure, but don’t need a stretch limo or even a town car? This is who you call! The folks that helm this operation have been one of our oldest clients for a completely separate business. So when they wanted to do something new and different, we were thrilled and ready for the challenge. They didn’t have any preconceived notions about the branding except the name, so we got to have free rein there. We decided on a elegant charcoal gray, but then wanted a pop of regal purple. We wanted to show quality, but not stuffiness, and suggested their chauffeurs wear the standard dark suit, but with a purple tie. For the icon, we toyed with several types of cars, but the very nature of this company is that the car is always different (it’s your car, not theirs)…so we settled on a chauffeur cap.